Why Is April 15 the Tax Deadline? Tax day falls on Monday, April 15, 2019. That's the deadline for filing taxes on income earned in 2018. For those who wish to file an extension, the deadline is April 15 and tax day is Tuesday, October 15, 2019. The Internal Revenue Service (IRS) expects to receive more than 14 million extension requests from taxpayers in 2019. Tax day is also the deadline for 2018 contributions to an individual retirement account. 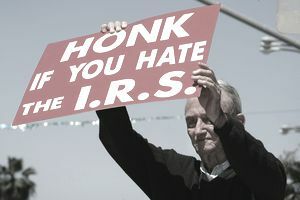 And, for those who live outside the United States, tax day is June 15, 2019, as the IRS grants them an automatic extension. The IRS began processing returns on January 22, 2019. Workers who have large withholdings on their W-2 often want to file early to receive their refund quickly. On average, it takes 21 days for the IRS to process the refund. When Is Tax Day Not on April 15? Tax day is usually April 15 unless that day falls on a weekend or holiday. In 2018, it fell on a Sunday. On Monday, the District of Columbia celebrated Emancipation Day. On that day in 1862, President Lincoln freed the slaves in the nation's capital. Although a local holiday, Emancipation Day affects taxes the same way as federal holidays. Those two events pushed the tax deadline to the following Tuesday, April 17. But the computer system for the IRS failed that day. As a result, the IRS extended the deadline to midnight, April 18. In 2018, Tax Freedom Day was April 19. Every dollar earned until that day goes to pay off that year's taxes. On average, families paid 33% of their total income in state, local, and federal taxes. Congress passed the 16th Amendment creating the income tax on February 3, 1913, which taxed income above $4,000. It designated the first tax deadline as March 1, 1913. Before that, the federal government used regressive taxes. It derived its revenue from tariffs on imports and exports. That hurt the middle class the most. They spend more of their income on these day-to-day necessities. It also taxed cigarettes and alcohol heavily. In fact, it received 90% of its revenue from those two taxes alone. Congress created a progressive income tax because it wanted to tax everyone more fairly. It had tried a national income tax in 1894. But it was unconstitutional because all federal taxes were based on state population at that time. The only solution was to amend the Constitution, and the 16th Amendment did just that. Congress gave everyone a year plus six weeks as the first deadline. Only 358,000 Americans filed returns, which was fewer than 0.4% of the population. To try and get more people to file, the Revenue Act of 1918 moved the deadline to March 15. It also imposed a 77% tax on the highest income. Congress needed to raise money for the U.S. involvement in World War I. It also sought to replace tariffs. World War I disrupted trade, significantly lowering the government's revenue from tariffs. The income tax was so successful that the Internal Revenue Service couldn't keep up. It hadn't finished auditing returns by the time taxes were due in 1919. The Depression lowered incomes so significantly that people stopped paying taxes. Congress raised rates and cut exemptions to fund World War II. It became a patriotic duty to pay taxes. Irving Berlin wrote songs and the IRS made posters reminding people to pay. The Treasury Department began withholding tax payments from workers' paychecks. The W-2 was born. In 1954, President Eisenhower asked Congress to reform the tax code. Congress added deductions and credits, making it more complicated. It also pushed the tax deadline back to April 15. Why? The IRS said it would "spread out the peak workload." It could also be because, as the middle class grew, the IRS had to issue more refunds. Pushing back the deadline let the federal government hold onto tax money just a bit longer. Emancipation Day also affected the tax deadlines in 2017, 2016, 2012 and 2011. It was extended to April 18 in 2017, April 17 in 2016 and 2012 and to April 18 in 2011. In 2020, the deadline will be Wednesday, April 15. Emancipation Day is the following day. Do Democrats' Economic Policies Work? What Are the Major Federal Government Subsidies? Why Did Obama Extend the Bush Tax Cuts in 2010? Was Bush or Obama Best for the Economy?